Renewable Energy Resources - Library - Index - Global Energy Network Institute - GENI is the highest priority objective of the World Game (R. Buckminster Fuller). In India nearly 400 thermal springs occur (Satellites like the IRS-1 have played an important role, through infrared photographs of the ground, in locating geothermal areas. The Puga valley in the Ladakh region has the most promising geothermal field. ), distributed in seven geothermal provinces. These provinces include The Himalayas: Sohana: West coast; Cambay: Son-Narmada-Tapi (SONATA): Godavari and Mahanadi. These springs are perennial and their surface temperature range from 37 to 90o C with a cumulative surface discharge of over 1000 l/m. The provinces are associated with major rifts or subduction tectonics and registered high heat flow and high geothermal gradient. For example the heat flow values and thermal gradients of these provinces are 468 mW/m2; 234o C/km (Himalayas); 93 mW/m2; 70o C/km (Cambay); 120 - 260 mW/m2; 60-90o C/km (SONATA); 129 mW/m2; 59o C/km (west coast); 104 mW/m2; 60o C/km (Godavari) and 200 mW/m2; 90o C/km (Bakreswar, Bihar). The reservoir temperature estimated using the above described geothermometers are 120o C (west coast), 150o C (Tattapani) and 200o C (Cambay). The depth of the reservoir in these provinces is at a depth of about 1 to 2 km (Chandrasekharam, 2000; Minissale et al., 2000). These geothermal systems are liquid dominated and steam dominated systems prevail only in Himalayan and Tattapani geothermal provinces. The issuing temperature of water at Tattapani is 90o C; at Puga (Himalaya) is 98o C and at Tuwa (Gujarat) is 98o C. The power generating capacity of these thermal springs is about 10,000 MW (Ravi Shanker, 1996). These are medium enthalpy resources, which can be utilized effectively to generate power using binary cycle method. Since majority of these springs are located in rural India, these springs can support small scale industries in such areas. Dehydrated vegetables and fruits have a potential export market and India being an agricultural country, this industry is best suited for India conditions. Map of India showing the geothermal provinces, heat flow values (mW/m2: in italics) and geothermal gradients (oC/km). I: Himalaya; II: Sohana; III: Cambay; IV: SONATA; V: West coast; VI: Godavari; VII: Mahanadi. M: Mehmadabad; B: Billimora. 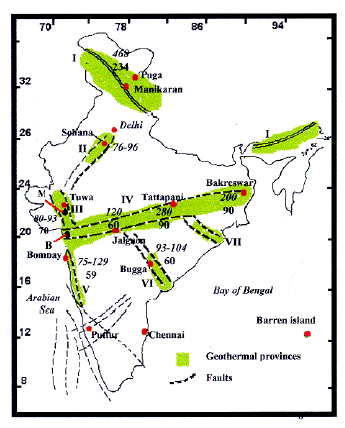 All the geothermal provinces of India are located in areas with high heat flow and geothermal gradients. The heat flow and thermal gradient values vary from 75–468 mW/m2 and 59–234°C respectively. Deep Seismic Sounding (DSS) profiles were carried out across several geothermal provinces (Son-Narmada-Tapi; West coast and Cambay ) to understand the crustal structure.